Life's a Beach | Expat Life in Playa del Carmen : Prepare to be "All Shook Up" in December! Do you love musical theatre? Do you love Elvis Presley? 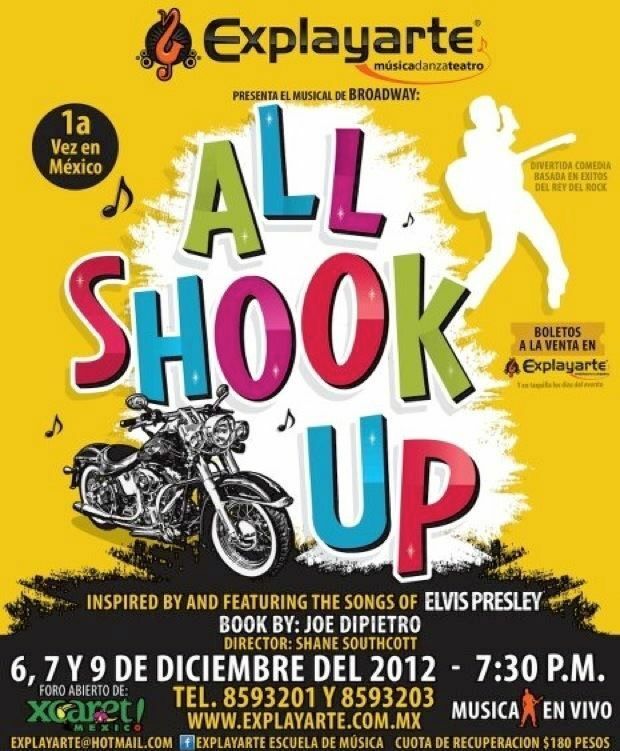 Then Explayarte invites YOU to enjoy their upcoming production, All Shook Up! All Shook Up is a musical comedy built around a selection of songs made famous by Elvis Presley. The story, based on William Shakespeare's 1602 play Twelfth Night, is set in 1955, in "any-town" middle America, where a young girl's dream and a surprise visit from a mysterious leather-jacketed, guitar-playing stranger help the small town to discover the magic of romance and the power of rock & roll. Among the 24 songs featured in the score are the beloved classics "Heartbreak Hotel," "Love Me Tender," "Don't Be Cruel," "Can't Help Falling in Love," and of course "All Shook Up". This exciting production, directed by Shane Southcott, will feature nearly 70 young local dancers, singers and musicians. If you have had the good fortune to see Jesus Christ Superstar, Pippin, Cats or Seussical, you know what kind of powerhouse production to expect from Explayarte and their amazingly talented team of directors, musicians, choreographers, designers and performers. If you have enjoyed any of these productions, you won't want to miss All Shook Up! The score will be performed LIVE by Explayarte's orchestra. The script has been translated into Spanish for this production, the first showing of All Shook Up to be performed in Mexico. English speakers unfamiliar with this show can familiarize themselves with the synopsis beforehand by checking out the All Shook Up listing on Wikipedia. Performances will be held December 6, 7 & 9 in the Foro Abierto at Xcaret. Curtain time will be 7:30pm sharp. Tickets will be available in advance (160 mn) at Explayarte, located on the Arco Vial across from Centro Maya, and the day of the event (180 mn) at the Xcaret box offices. For more information call 984-859-3201 (3203). Si te gusta el teatro musical, Explayarte te invita a disfrutar de su nueva producción All Shook Up, divertidísima comedia basada en éxitos de Elvis Presley, casi de 70 jóvenes actores, bailarines, cantantes y músicos en escena, no te la pierdas! Cuota de recuperación: $160.00 en preventa y $180.00 en taquilla el día del evento. # ¡Por Primera Vez en México, el Musical de Broadway ALL SHOOK UP! Tuesday, November 27, 2012 4:23 PM by ¿Que Pasa Riviera Maya?